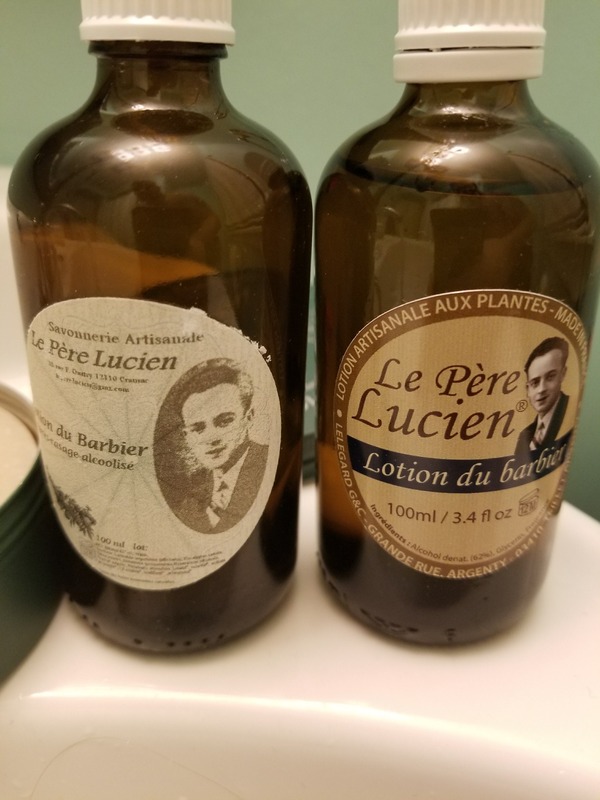 Le Pere Lucien aftershave lotion is an old timey barber's lotion. "The Father Lucien" aftershave splash is fresh and woody. Rich in essential oils and vegetable glycerine, it moisturizes and immediately soothes razor burn. It's fragrance combines perfectly with the Le Pere Lucien shaving soap. I love this stuff. Excellent scent, invigorating and leaves my skin feeling great. I ordered a new bottle as my last was almost empty. The first thing that I did was open it to smell it. My first thought was, oh no I must have ordered the wrong thing. The label was different but the description was the same. I compared it to the little bit I had left in the older bottle and there is a very obvious difference. The new bottles scent is similar but much less potent. I really enjoyed the originals fragrance but this new one is just so so. I am guessing that the formula was revised? I much preferred the previous. My original bottle would linger on my skin for an hour or so, perfect as I don't want it to interfere with my cologne but enough that I can enjoy it for a little while. The new bottles scent is gone in a flash. I can barely smell it as I am applying it. It is still wonderful but I much prefer the older bottle that I have. What a great little aftershave. Not like anything else out there and matches perfectly with LpL's traditional shaving soap. Booth, Mark said: Le Père Lucien - Really Good Stuff! Le Père Lucien Aftershave Splash is a top-tier aftershave both post shave performance and fragrance. If one likes Crown Shaving Aftershave and Captain's Choice sandalwood or bay rum fragrances then you'll probably enjoy this well balanced but "warm" woodsy fragrance. Le Père Lucien products are superlatively refined and well thought out. I find this aftershave to reflect LPL's consistent performance -- "highly" soothing of irritation, and just the right amount of light hydration and humectant properties but light on the skin. The essential oils are well thought out for both skincare and achieve a balanced fragrance profile -- once dried its not a bold "in your face" cheap-like fragrance but subtle and "improves" as it wears and easily lingers for 1-3 hours. On my neck or forearm I can get subtle and lingering rosemary, neroli, and sensuous woody hints well into my day as much as any true aftershave should be expected. This is a subtle but romantic fragrance that my wife comments on when she gives me a hug or kiss. Which is half the reason I am always well shaven and always smell like a gentleman, and manage to stay out of jail. LOL! When I first tried it, it seemed fairly strong. So I applied a small amount. The fragrance didn't last, so the next time I used a generous amount. It lasted an hour or two longer, but was rather faint. But I do appreciate the opportunity to try different items. The fragrance is fantastic, unfortunately it is so mild that it is gone moments after it hits your face. For the price, I would recommend looking for something with a more noteworthy aromatic experience. Great service, as always from Bullgoose. Best place to buy. I don't even look at other places anymore. WOW! This is what I call service. Ordered on a Sat. had at my door by Tues. afternoon. Fast ad easy service. Great place to get your wet shave supplies. HIGHLY RECOMMEND..